In a non-linear world, there is no relation between the strength of the cause and the consequence of the new effect. July 1977 was a hot month in New York City. The temperatures had been in the 80s for weeks. The stench of rotting garbage hung in the air. The sun bounced off the asphalt, as aircon units sputtered and whirred in the windows of apartment blocks. On Wednesday the 13th the humidity was building all day. At 20:37 lightning hit 2 extra high voltage lines in Westchester County, upstate New York, taking them out, and causing increased load to build in the rest of the system. At 20:56 lightning struck again, taking out two more lines. 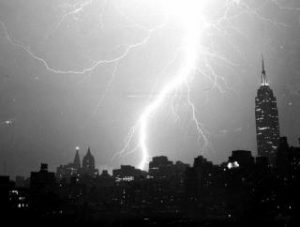 By 21:36 there was a blackout across the whole of the five boroughs of New York City, in some areas for up to 25 hours. The result was widespread rioting across New York City, in what some papers described as “a night of terror”. Change always involves a dark night where everything falls apart. Yet if this period of dissolution is used to create new meaning, then chaos ends and new order emerges. In the early 70s in the Bronx and Harlem, a new musical form was beginning to take shape. It was a reaction to the slick style of Disco. 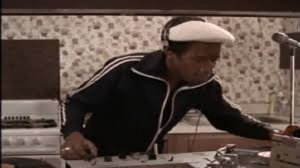 One of the pioneers, Grandmaster Flash, was leading the way with his technique of using a wax crayon to mark the hooks from Disco hits, allowing him to sample and mix records at speed. Flash and his crew, The Furious Five, were the talk of the boroughs, and a generation was looking to emulate them. However, running a crew was expensive, as you needed mics, turntables and mixers; and this was beyond the reach of most people. Then came the blackout. There was looting, and a disproportionate number of electronics shops were targeted. Bronx MC Grandmaster Caz remembers a group pulling down the gates on the South Bronx store front, The Sound Room, and kids making off with armfuls of Clubman 2 mixers. By the time the power came back up there was a wealth of musical equipment available, and, in Caz’s words, “everyone was an MC now”. This was the point that hip hop started to make the leap from the underground. The increased availability of equipment lead to the formation of lots of different crews. Rap battles were held regularly where audiences voted for the winning crew through the volume of their applause. Hip hop was the talk of the street. Bootleg tapes were made of these battles and circulated. These were copied and shared and reputations were made and ruined. One such epic rap battle was between Grand Wizard Theodore and the Fantastic Five, and the Cold Crush Brothers. On audience volume the Fantastic Five were declared the winners. But as the bootleg tapes were circulated, the tide of opinion changed – the view being that the Fantastic Five had loaded the audience with supporters, and Cold Crush had the better texts. The rhymes of the Cold Crush Brothers passed from hand to hand and voice to voice, and their reputation spread across the city. By 1979 the hip hop underground had drawn enough attention for downtown record labels to want to get in on the act. 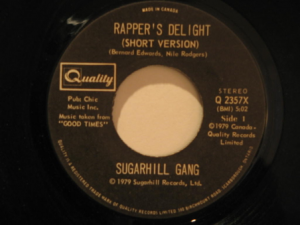 “Rapper’s Delight”, by the Sugar Hill Gang, was the first commercially cut hip hoptrack and took the nation’s airwaves by storm that summer. With record label backing, and coinciding with the growth of affordable international air travel, the Sugar Hill Gang also took to the air, and popular music culture was changed forever. It may seem an unusual example, but sometimes it’s nice to have an alternative to the butterfly flapping its wings. For those of us working in organisations perhaps it is a reminder that for all our strategizing and planning, organisations are also bundles of complex intentions and interactions. At any time, news of difference may arrive, and the rules of the game may change.